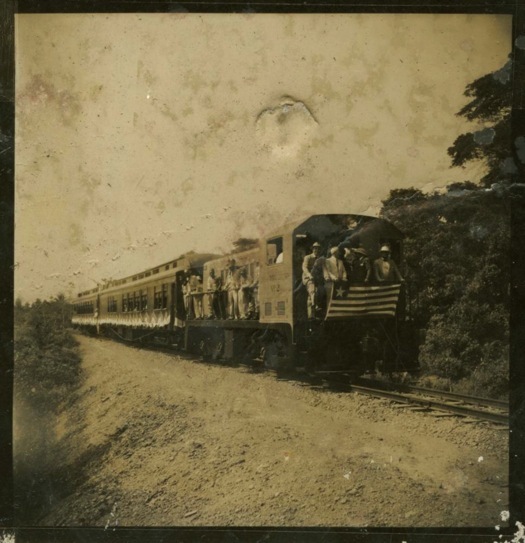 The photograph below highlights the importance of transportation infrastructure and the opening of corridors, especially railroads, in the mid-twentieth century development of Liberia’s natural resource extraction economy and the subsequent impact on the country’s rural inhabitants. The photograph was taken in 1952, on occasion of the inauguration of the Antoinette Tubman railroad bridge, eventually to be used to connect the interior of Liberia with the global economy. This opening turned soon into a recipe for environmental degradation and the impoverishment of thousands of rural Liberians. Click here to view Indiana University source. The 69 kilometer narrow-gauge railway on which the train runs would be used to export tons of iron ores from the Bomi Hills deposits in Western Liberia. The photograph, with the prominence given to the US-inspired Liberian flag, also highlights the long-standing political and economic relationship between the United States and Liberia. Founded by African Americans in the early nineteenth century, the West African nation has, throughout its history, been dependent on US economic and political intervention. The granting of a concession for iron ore extraction after World War II, which gave access to land for mining to US investor Lansdell K. Christie, a former US Army officer and founder of the Liberia Mining Company (LMC), was not the first concessionary agreement Liberia made to an American private investor. The first one was in 1926 when the Liberian government granted “up to one million acres” in concession to Harvey Firestone, Jr. (founder of the Firestone Tire and Rubber Company) to cultivate natural rubber. Extract from John R. Hokanson, A market for U.S. products in Liberia, Washinton, DC: U.S. Department of Commerce, Bureau of International Commerce, 1965. Click here to view Wikimedia source. The granting of a mining concession to Christie was part of an “open door policy” proposed and implemented by the administration of the nineteenth President of Liberia, William V.S. Tubman, in the 1940s. The policy was meant to open up the Liberian hinterlands to foreign companies. Liberia had abundant natural resources, such as iron ores, gold, diamond, and timber, and the proponents of the open door policy believed that the only way Liberians could benefit from these resources was to open up the country to foreign direct investment. Once prospectors discovered commercial iron ore deposits, the government and the LMC (the first iron ore mining company in Liberia) signed a mining concession agreement that gave the company rights to develop Bomi Hills, situated in Western Liberia and mostly inhabited by the Golas and Vai tribes. Between the start of operations in 1951 and their closure in 1977 the company exported $540 million worth of iron ores. The framers of the “open door policy”, as well as those who benefited such as the LMC and the Liberian government, did not take into consideration the adverse effects of the policy’s implementation on the Golas and the Vai and on future generations. As a non-renewable resource, the Bomi Hills iron ores deposit was depleted in the span of a mere 27 years. 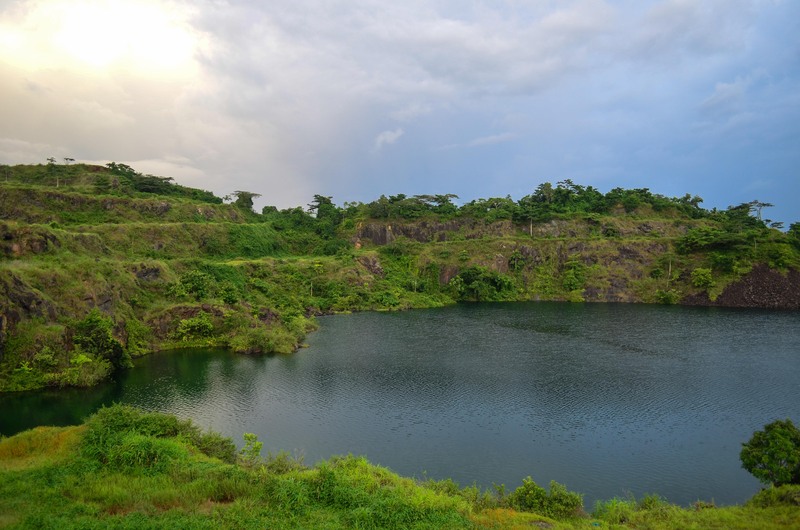 Today, what remains in the former Bomi Hills are a degraded landscape with deep holes, which is why Liberians today refers to Bomi Hills as “Bomi Holes”. 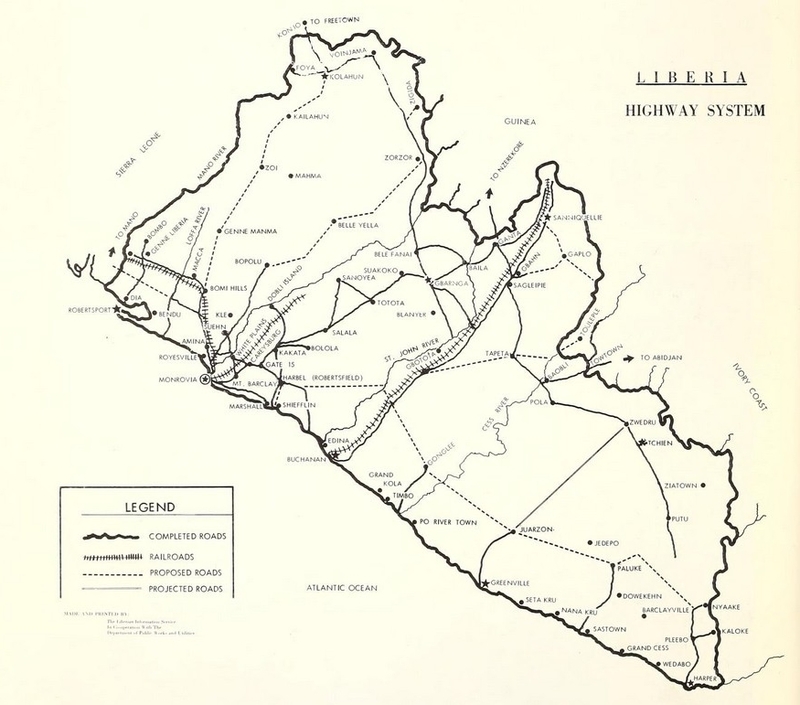 Urey, Emmanuel K.. “Corridors, Concessions, and the Extraction of Natural Resources in Liberia.” Environment & Society Portal, Arcadia (2015), no. 8. Rachel Carson Center for Environment and Society. https://doi.org/10.5282/rcc/6945. Clower, Robert W. Growth without Development: An Economic Survey of Liberia. Evanston [Ill.: Northwestern University Press, 1966. Carlsson, Jerker. The Limits to Structural Change: A Comparative Study of Foreign Direct Investments in Liberia and Ghana, 1950-1971. Uppsala; Stockholm: Scandinavian Institute of African Studies in cooperation with Dept. of Economic History, University of Gothenburg, 1981. Kraaij, F. P. M. van der. The Open Door Policy of Liberia: An Economic History of Modern Liberia. Bremen: Im Selbstverlag des Museums, 1983. Somah, Syrulwa L. Historical Settlement of Liberia and Its Environmental Impact. Lanham: University Press of America, 1995. Emmanuel K. Urey is a PhD student at the Nelson Institute for Environmental Studies, University of Wisconsin-Madison. His research focuses on rural livelihoods, and health, culture, sustainable development, environmental issues, the management of common property, land tenure and dispute resolutions, impacts of large-scale concessions on rural people as well as environmental and social justice issues. He is a co-winner of the 2014 Wisconsin Without Borders Global Scholarship Award. He recently published an article on mongabay.com on the environmental causes of the Ebola outbreak in West Africa.